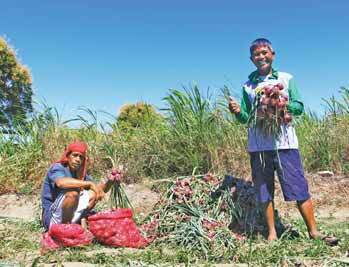 By Julio P. Yap Jr.
A farmer was able to harvest at least 7.29 tons of red onions from his 3,500-square-meter farmland. According to Victor Layug, he was able to attain a bountiful harvest by efficiently spraying his onion plants with Amino Plus Foliar Fertilizer or APFF at least twice a week, depending on the weather prevailing in their area. 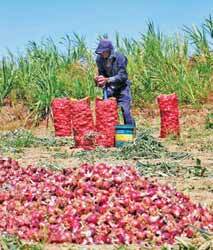 He says that prior to using APFF, he could harvest only about 4.5 tons of onion from his small farmland in Barangay Togatog, Bongabon, Nueva Ecija. During Layug’s cropping season last March, he was able to harvest at least 243 net bags of onions, and each bag weighed about 30 kilos. 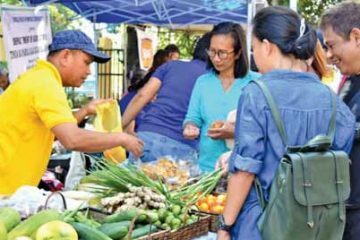 He says that his harvest could be worth about P218,700 if he can sell his produce at the prevailing price of P30 per kilo. As seen during a recent visit to Layug’s farm during harvest time, the size of the bulbs and their intense color were impressive. He says that these are the characteristics which are sought after by the local traders and even consumers. Based on the excellent performance of his yield, Layug says he will continue to use APFF during the next planting season, which is expected to start before the year ends. However, Layug stressed that he will be planting a better onion variety during the next planting season, like hybrid onions—which he has tested before—to attain a better harvest that he expects could give him an even bigger income. Initially, Layug was hesitant to use APFF when Manny Pablo of Global Green Organic Fertilizer, Inc. introduced the product to him. But when he saw the results, he immediately sprayed his onion plants vigorously and regularly with it, which resulted in better yields. According to Pablo, damage to agricultural crops due to weather disturbances could be prevented or minimized with the proper application of farm inputs like organic fertilizers and other related products. He says that plants sprayed with APFF are more resistant to diseases and other stresses in the field. Layug claims that his onion is sought after by local traders and consumers due to its characteristics. When sprayed, it effectively adheres to the plant’s surface and provides quick supplementation. This is because APFF contains compounds that promote plant growth and does not contain toxic or carcinogenic materials; thus, it is a good source of fertilizer. 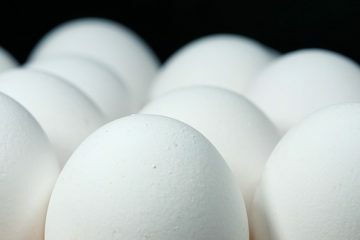 It is high in L-Amino acids that are easily absorbed by plants. It also contains effective microorganisms that have long-term beneficial effects on the physical, chemical, and biological condition of the soil. 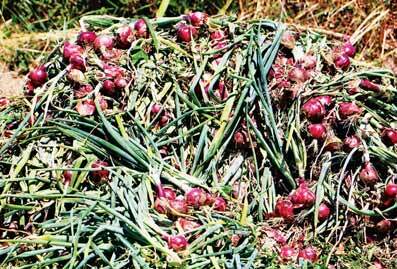 Layug says that cultivating onion could become easy, but to have a good yield, proper cultural management practices and the right amount of fertilizer should be provided. High production costs due to the increasing costs of commercial fertilizers is one of the main problems of small scale farmers like Layug. 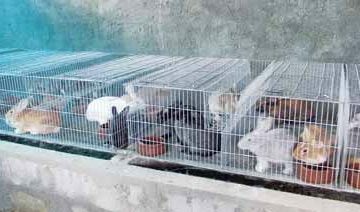 But Pablo says that one way to solve this problem is to apply organic fertilizers like APFF. Application of organic materials can also prevent erosion of the soil, cracking, and crusting. It can also help retain soil humidity and improve soil’s internal drainage. 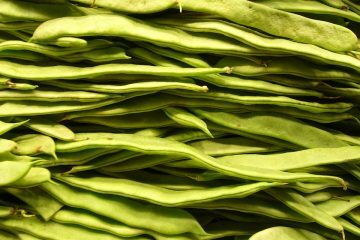 He added that crops fertilized with organic matter can have greater resistance to pests and diseases. 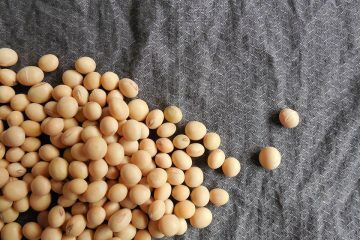 The humus acid and growth substances are absorbed into the plant tissue through the roots and they favor the formation of proteins by influencing the synthesis of enzymes that will increase the vigor and insect resistance of the plant. The weeds growing in Layug’s farmland were immediately removed by hand-pulling to keep the area clean and to avoid forcing his crops to compete with the weeds for nutrients, water, sunlight, oxygen, and other factors that can affect the growth and development of the onion bulbs. Layug was able to prevent armyworms, locally known as harabas, from damaging his crops by applying Nordox 75WG micronized fungicide regularly. He related that the crops of the others farmers near his farm were already being attacked by armyworms, but his onion plantation remained almost pest-free due to the use of Nordox because it is a micronized copper fungicide which provided protection to his plants. Nordox is certified by the IMO and OMRI as organic, like AFPP, which is also certified organic by the Organic Certification Center of the Philippines (OCCP). This appeared on Agriculture Monthly’s April 2018 issue. Agriculture Monthly magazine is the Philippines' best-selling magazine on all things agriculture. 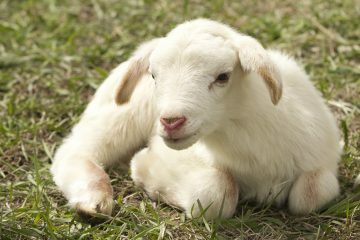 Helmed by veteran agriculture journalist Zac B. Sarian, the magazine is packed with information and inspiration on how to make the most of your farm or garden. 3 days ago by agriculturemagazine You gotta start somewhere! 5 days ago by agriculturemagazine It’s the best field there is. 2 days ago by agriculturemagazine This should be done to all kinds of crops other than garlic. 4 days ago by agriculturemagazine Hard same. Agriculture Monthly is a product of Manila Bulletin Publishing, Inc.